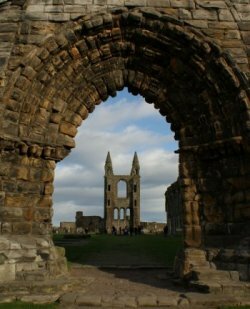 Founded in 1160 and consecrated in 1318 in the presence of Robert the Bruce, the building of St Andrews Cathedral established St Andrews as the ecclesiastical centre of Scotland and a major centre of pilgrimage. It stands within the old city wall at the east end of St Andrews and was by far the largest cathedral in Scotland and one of the longest in Britain with a 14-bay nave, five-bay choir and an internal length of 357 feet (109 m). Established as an Augustinian foundation and used for over three centuries, the Cathedral was eventually destroyed by Protestant fanatics in 1559 during the Reformation. In its churchyard are the graves of many famous Scots including the sociologist Adam Ferguson, the publisher Robert Chambers and the championship golfer Tommy Morris.